Here are a few guidelines you can take from within to build your self worth, esteem, and help you bring out all you desire to be and express in your life. They are phrased in first person to help you integrate them, until you are living your truth on all levels, in all areas of your life and are, in fact, genuinely feeling pure love and acceptance for yourself. * I remember that whether or not someone is in my life is never a reflection of me; it is merely a reflection of their preference, and I honor their preference without taking it personally and allowing it to hurt me. * I remember that whether I believe I can or I believe I can’t, I’m right! * I know that what I create in my life is an expression of what fills my heart with joy. It is never a validation of who I am–it is pure expression. * I know that outward status does not constitute a person’s worth. All people are equally worthy during pleasant times and unpleasant times. * I realize that my greatest challenges have been my greatest teachers. I have learned much from the difficulties I have been through, and I help others, even if only by sharing. * I create every circumstance in my life, and I do so in cooperation with others, all with pure motives. ** Decide. I decide how I want to feel, how I prefer to live, and how I prefer to create my life. ** Commit. I commit fully to the process. ** Be Willing. I am willing to do whatever it takes with dignity and pure motives, including the mirror dialogue, to help me shine from the inside out. ** Let Go. I let go of the expectations of others, along with my doubts, and replace them with what feels true for me. ** Follow. I follow my truth every moment, and I follow through in my actions everything that represents my highest and deepest truth. ** Wait. I have patience with an ever unfolding process in my life, and I remember to enjoy the process rather than just live for an outcome. ** Experience. I am experiencing all I first decided to, and now I am living completely in the moment, enjoying this journey called my life. * My creative expression is too important to stifle out of fear of what others think. I bring my creative expression out from my heart because I care that it makes a difference while I enjoy the process. * My romantic relationship is with a person who is my dearest and best friend. We are fully supportive of each other and trust each other completely. * I listen to my body and rest when I feel tired, go for a walk in nature when I need rejuvenation, and consume only what is good for my body. * I remember that the goals I am working to achieve constitute every moment of my life, and I live them out with passion. * I ask for support when I need it, and allow myself to be real. * In my writings to God, I ask to know about anything that is unconsciously holding me back, and how to transform it. * In my writings, and each day, I ask to be divinely guided toward only what is for my highest good and the highest good of all. * I speak to and treat all others in the same manner that I would want to be treated and spoken to. * I stop looking for outward status and start being a pure change that I would love to see in this world. * I never explain my personal views or spiritual preferences to people who cannot relate. I share what I choose to share only with people who can be supportive rather than arguing with me to negate my truth. * I select my close personal friends very carefully based on the goodness in their hearts, and for no other reason. * I remember to ask for pointers and guidance from people who are in a position I would like to move into, and I trust they will be happy to give me a few pointers in a positive direction. * I admit my true feelings to myself rather than fighting them and trying to make them go away. They are trying to tell me something I need to acknowledge and know. * I create my life’s work and purpose based solely on heartfelt inspiration. Passion, not outcomes, fuels my purpose. * I fully trust that when something does not work out the way my personality wanted it to, ultimately, it worked out for my highest good. * I trust that any delay is a blessing in disguise. * I set priorities for my daily activities according to what I feel most inspired to do. My schedule is filled only with what I love. * I stop doing anything that no longer brings me joy, with the exception of caring for my children, and clear out any part of my life that I no longer feel excited about. * I know that I am the creator today of what my life will look like tomorrow. * If I ever worry about what others are going to think, I remind myself that anyone can think many things. What is most important is following through with what I believe in my heart is real and true, so long as it brings harm to no one, including myself. * I stay away from drama, gossip, negative people, and negative situations. I surround myself only with people and situations that reflect the pure truth inside my heart. * I stop trying to follow what others are doing, and instead create and bring out what I love as my own unique contribution to my life and this world. * I remember that no matter how successful a person may be, the truest form of success is a loving and pure heart. That is priceless and eternal. © Copyright 2009, 2012 Barbara Rose, PhD All Rights Reserved. Exclusive Excerpt from the book The Ultimate Guide to Self Love (Published by The Rose Group, September 2009) ISBN:0979516153. 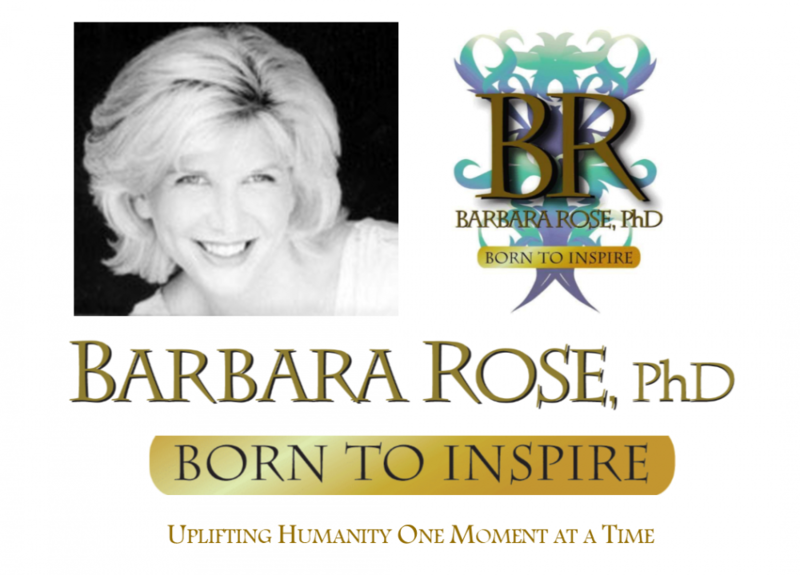 Dr. Barbara Sherry Rose, most widely known as “Born To Inspire” was born in Bayside, New York. She attended Franklin College in Lugano, Switzerland, was an honor student at The American University School of International Service in Washington, D.C., and was inducted into Kappa Tau Alpha National Honor Society for Journalism and Mass Communication. Dr. Rose is the bestselling author of twenty five books, a world renowned Life Transformation Specialist, and one of today’s most loved and respected spiritual teachers. As Founder of International Institute of Higher Self Communication merged with Global Life Transformation Foundation she shares the nondenominational process of receiving answers from God, transforming the lives of millions across the globe. Her highly acclaimed work is widely sought after and published internationally with subscribers spanning 191 countries. The following are key questions submitted by my subscribers along with the answers. They are here for you to help you honor your real truth, so that you can feel self love and your genuine worth as an equal member of the human race, which you most certainly are! “Yes. This is a lot simpler than many realize. Every time you notice yourself feeling overwhelmed with fear, immediately become consciously aware of the thoughts that are going through your mind. You will most likely discover that the ego has run rampant with mental thoughts and projections out in the future, creating scenarios within your mind that are actually causing your fears. The desire you have is trying to fill an inner void that you feel, and your thinking that if you had a fulfilling relationship THEN you would be happy is the ego leading you down a path that will always be filled with uncertainty, worry, and even anxiety. If you DID have the relationship and perhaps had a misunderstanding or a break-up, then your sense of joy would be shattered because it is DEPENDENT upon the other person. Ideally, what you must re-discover is all of the goodness within you, as well as how you can bring your own unique purpose and expression out in your life, so your joy is created from within. Then it cannot be taken away from you. When you reach the point that you feel very fulfilled from within, and are perfectly neutral about a relationship, meaning that you are truly happy without one, and are simultaneously open to experiencing a great one when a phenomenal person enters your life, then you will be ready to share yourself and create a fulfilling relationship based on building a pure, solid friendship over time. Your relationship will no longer come from a place of NEED, but of choice, while you feel the inner confidence to be completely transparent, sharing your authentic self. Additionally, you ideally would be far better off really becoming your own best friend FIRST, so that you attract a person with the same high level of self love and esteem who will have the capacity to be entirely authentic with you. You can say that you’re not able to, or that it’s just not a good time for you, or you don’t feel comfortable doing what is being asked of you. Like anything else, in the beginning it feels scary to say “no”, but each time you do, you are building a strong foundation of self truth that creates a clear, definitive, and healthy internal boundary that you can count on, which leads to tremendous self confidence and high self esteem. What you are doing is honoring your truth, rather than forsaking your truth just to please someone else in order to gain approval and acceptance, or to look good. This gets easier and easier each time you honor your real truth, based on how you really feel. After a while you will automatically reply coming from a place of pure self truth, and you will feel great about it, because you are giving yourself the acceptance that you previously felt you needed from the other person. Your self esteem grows stronger each time, built on authenticity. Then, you realize you are becoming your own best friend, and will never again let yourself down just to please another person.